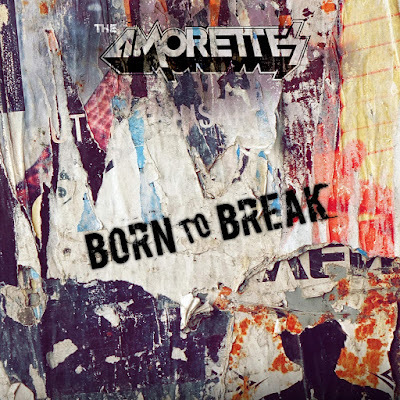 The Amorettes have released the title track of their new album "Born To Break," as a single, alongside a new lyric video, courtesy of Andy Pilkington at Very Metal Art. "'Born to Break' is the title track from the current album," songwriter-guitarist-vocalist Gill Montgomery said. "It's consequently what inspired the overall theme of the entire album." "Born To Break" is the third single from the UK Top 40 hit album "Born To Break" and drawing on a range of personal experiences during the writing process, Montgomery was able to bring some of her most diverse songs and creative writing to the fore. "Everyone goes through crap in their life," Montgomery said. "For me, this is a song about having the resilience to battle through the tough times that life throws at you, and the strength to focus on the positives in life, which should be celebrated." Whilst today's popular music world seems to be based around the idea of style over substance, Scottish Hard Rock Trio THE AMORETTES have a very simple plan: Taking over the world, one show at a time. No fuss. No gimmicks. Just good, old-fashioned hard work and great songs. Anyone who's ever experienced an AMORETTES live show can easily testify to the buzz of expectation that kicks in as soon the lights go down and the intro rolls. Never has the Slade track, We'll bring the house down been so prophetic in its meaning. The roar from the crowd builds expectation from the very start and the energy and intensity doesn't let up until we reach the end together. Witness the audience sing-a-long during the anthemic set closer "Hot And Heavy," a track always pre-empted by vocalist/guitarist Gill Montgomery asking the sweat soaked audience, "Is everybody hot? Do you like it heavy?" Relentless touring across the UK and Europe has helped turn THE AMORETTES into a lean, mean, Rock and Roll machine, leading them to be described as "Like Airbourne fronted by Joan Jett." Reviews for both live shows and the albums, only reinforce the fact that THE AMORETTES star is still very much in ascendance, and, as long as there are stages to play, and records to make, there is no sign of this "Female Motorhead" attempting to take the easy road to the top.